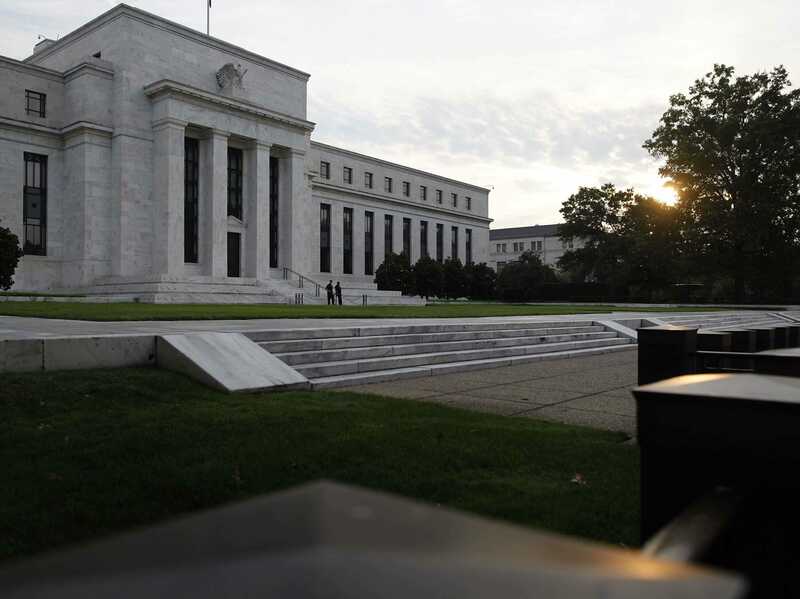 REUTERS/Jonathan ErnstThe U.S. Federal Reserve building in Washington. The market is open and stocks are falling. In early trade on Wednesday, the Dow was down 53 points, the S&P 500 was down 9 points, and the Nasdaq was down 34 points. The decline in stocks on Wednesday comes after both the Dow and the S&P 500 made new all-time highs on Tuesday, and comes ahead of the release of the minutes from the Federal Reserve’s most recent FOMC meeting. The minutes are set for release at 2:00 pm ET, and are expected to provide the market with insight into the FOMC’s thinking at its last monetary policy meeting, where the Committee made the decision to end its quantitative easing program. The economic calendar is light on Wednesday, with just housing data coming out in the form of housing starts and building permits. The report was mixed, with housing starts slowing more than expected, and building permits rising more than expected. In stock news, Tesla is among the notable losers, falling about 4% in early trade after a research report form Morgan Stanley said the electric carmaker will sell 10,000 fewer Model X SUVs in 2015 than the firm previously expected. Staples shares were up more than 8% after the company announced third quarter results that saw adjusted profit beat expectations by a penny, and sales come in at about $US6 billion, more than the $US5.93 billion expected by analysts. On a year-over-year basis, however, sales fell 2.5%, as sales in North America fell about 6%, though online sales through Staples.com rose 9% over the prior year.